WASHINGTON — Proponents of nuclear power are pushing to revive a failed project to build two reactors in South Carolina, arguing that the demise of the $14 billion venture could signal doom for an industry that supplies one-fifth of the nation’s electricity. Even though the nation’s 99 commercial nuclear reactors supply about 20 percent of U.S. electricity, no new nuclear plant has been built from scratch in more than 30 years. Supporters were alarmed when two South Carolina utilities halted construction on a pair of reactors that once were projected to usher in a new generation of nuclear power to provide reliable, cost-effective, carbon-free electricity for decades. Instead the project was plagued by billions of dollars in cost overruns, stagnant demand for electricity, competition from cheap natural gas and – most importantly – the bankruptcy of Westinghouse Electric, the lead contractor. The July 31 suspension of the partly completed V.C. Summer project near Columbia, South Carolina, leaves two nuclear reactors under construction in Georgia as the only ones being built in the U.S. The collapse of the nearly decade-old project in South Carolina could cost ratepayers billions of dollars for work that ultimately provides no electricity and could signal that new nuclear plants are impossible to complete in the United States. “These reactors failing would be the end of a nuclear renaissance before it even started,” said Sen. Lindsey Graham, R-S.C.
Graham and other lawmakers from both parties are urging Congress to extend a production tax credit that would provide billions of dollars to the South Carolina project and the two Georgia reactors. The House approved an extension in June, and Graham is pushing for a Senate vote after Congress returns from its August recess. “I’m mad as hell that you spend all this money and you can’t get it done,” Graham said. The Vogtle plant in Georgia faces similar economic and competitive threats, including the Westinghouse bankruptcy. The plant’s operator, Atlanta-based Southern Co., has said it will decide in coming weeks whether to finish the two reactors, which are years behind schedule and billions of dollars above projected costs. Southern CEO Tom Fanning called Vogtle “the last (nuclear) project standing in America” and said it “goes beyond economics” to affect national security. “If you want a world safe from nuclear proliferation,” construction of nuclear plants “is how we maintain nuclear technology,” said Rich Powell, executive director of ClearPath, a conservative-leaning clean energy group. Besides the production tax credit, nuclear supporters want the extension of an Energy Department loan guarantee program that has helped Vogtle and other energy projects secure funding. Vogtle received an $8.3 billion loan guarantee under the Obama administration – the largest ever issued by the loan program and a deal that some critics say could end up biting taxpayers. “We’ve said it for eight years: These massive nuclear reactor projects were doomed from the start, and taxpayer money should not be risked on them,” said Ryan Alexander, president of Taxpayers for Common Sense, a watchdog group. A spokeswoman for Perry said the project’s failure has not dimmed Perry’s belief in nuclear power. 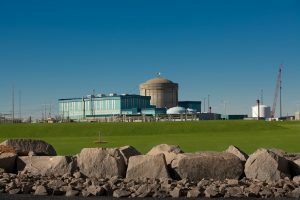 “Secretary Perry remains optimistic about the future of nuclear energy in America and continues to watch this issue closely,” said spokeswoman Shaylyn Hynes. The Energy Department invited the S.C. utility to apply for a loan guarantee, but “that invitation was ultimately turned down by the project’s representatives,” Hynes said. The loan guarantees typically serve as long-term incentives for companies to take on major energy projects. While President Donald Trump backs nuclear energy, the administration eliminated the loan guarantee program in its proposed budget for the next fiscal year. The program was a frequent target of GOP lawmakers during the Obama administration, especially a $535 million loan to the failed solar company Solyndra. The current credit requires plants to be operational by 2020 – a deadline neither the South Carolina nor Georgia project will come close to meeting. Rep. Jeff Duncan, R-S.C., called suspension of the South Carolina project a shame. “I can tell you, wind and solar are not going to provide the kind of power that nuclear energy provides,” he said. Associated Press writer Seanna Adcox in Columbia, South Carolina, contributed to this report.